I've seen the squirrels eating many things around our property and have heard from others in our community about things they consume. We've had them eat bulbs, flowers and a variety of plant leaves. This year our surprises were green holly berries and the leaves of Black-eyed Susan (Rudebekia). Because the community we live in has an on-going war with wildlife, I'm involved with others in trying to keep a deer killing program from being implemented here. The people want them killed not because there are any accidents (none reported to the community police), or because of disease issues (none in deer or people with Lyme disease). The studies done do not show we have an overpopulation problem, but we have deer that keep doing what deer do. 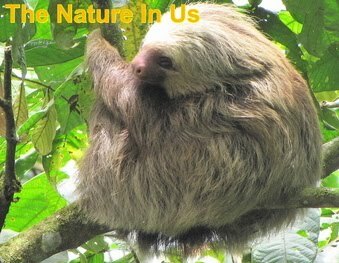 They eat plants and some people move to the woods not realizing that you can't plant city gardens amidst a wildlife ecosystem. These people want to kill deer because they eat hosta, lilies and roses. It's not that you can't have a beautiful garden here ... ours has been called lush and jungle-like ... but to hear these angry people, their entire landscape has been consumed. If so, sadly, they didn't put much thought into their landscaping plan. It's a great place to garden ... you just have to be wise about what you plant and to that end we've been trying to get an education program for many years, but the debate on the "culling" program continues. Well ... that's my personal ongoing saga ... but for that reason I captured a video of a squirrel on our deck eating the plant leaves. The folks angry at deer don't seem to realize that deer are not the only ones that like plants. We have rabbits and squirrels that eat all day long, whereas deer browse for awhile and then rest. 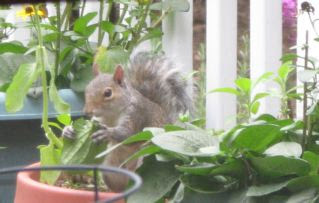 View Squirrel Eating Plants and then leave comments on what the squirrels eat at your house. Maybe it will help me to fight the battle to save the deer here in our community. ukplpThe squirrels here loved tomato plants, so I gave up on planting them...they also love to eat many of the leaves on my flower plants. I have to say it was cute watching the little guy!